Within the FileChimp Application there are some preset options to help making rules easy. Each option looks at either the file name or a specific file attribute in order to understand which network folder the file must be moved to. Each option is exclusive and your target folder name should match the result of the query (or be part of the destination folder name where partial match is used). Use [match] to consider only what is between square brackets [ ] when looking at a source file name. Best use - You want to control exactly which folder FileChimp will find and you know your project folders well! 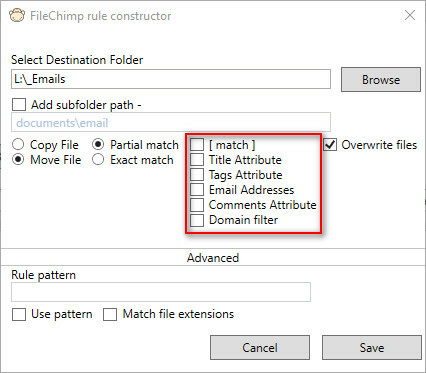 Use "Title Attribute" where you are using the FileChimp Outlook Addin and are filing emails into FileChimp sync folders. Each time an email is placed in a sync folder it is filed into the Sync folder output folder and the file 'title' attributes are set to match the sync folder name used within Outlook. Use "Tags Attribute" when you are adding tags to your filed emails using the FileChimp Outlook addin. Each time you file an email and add tags these are added to the 'tag' attribute of the file. Best use - This may have varied case uses but could be used to record which department the file was relevant to eg. Accounts or Technical. Tip - By specifying more than one tag it is possible to save the file to more than 1 location on the network at the same time. Use 'Email addresses' when you want to match an email address found in a filename. Also see 'comments attribute' match below which is our most popular method for auto-filing. Use 'Comments attribute' if you are using the FileChimp Outlook addin and you want to save emails into folders matching the email address of the recipients or senders of the email. When emails are saved from the FileChimp Outlook addin they include all participants email addresses in the 'Comments' file attribute. See an example here. The domain filter uses the same information stored in the comments file attribute but is filtered to act only on domain names found.